Three and half years ago, a mewing little rosebud made her debut bringing a sweetness to my life which I savor most every day. Also making her first appearance that May day was a little pink bunny blanket affectionately known as Bubba. Shanel brought it to Ava the day she was born and I immediately swaddled her in it. Bubba was Ava’s first and possibly favorite friend. Look how she keeps baby Ava so cozy in her Maclaren. Bubba has gone just about everywhere with Ava. Car rides, stroller rides, burley rides, plane rides and sling rides. She has been to every doctor visit and dentist visit. She has gone to the gym, the grocery store, the mall, post office, the babysitters, and the church nursery. She is a scarf, a pillow, a pacifier, a buddy, a chew toy, and a tissue. And most importantly Bubba falls asleep every night in Ava’s arms. There have been only two fitful nights that Bubba and Ava spent apart. When Ava was about fourteen months old, she lost her Bubba in the church nursery. I looked for her, the volunteers looked for her, and even the nursery coordinator looked for her. I was sure that Bubba had been accidentally sent home with some other child. If only they had a claim tag for Bubba. On Tuesday morning Ava went back to the nursery for a mom’s morning gathering. When I came to pick her up she had Bubba clenched in her fists. Astonished, I asked the volunteer who had found the bunny. The lady held her hands up and said, “It was the strangest thing. 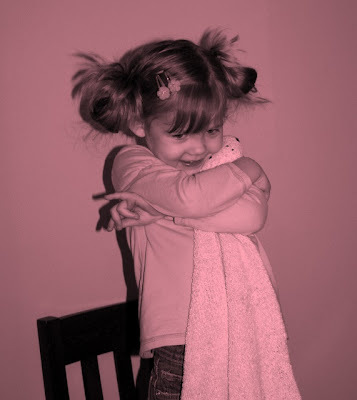 All of the sudden she had that bunny in her arms. We don’t know where it came from.” However she found her Bubba is unknown, but I can tell you she has not let her out of her sight since. Ava has loved away the pink and the fluff. The stuffing in her head has been relocated to the right side and her face has been powdered in a dingy shade of gray. The tops of her ears have been gnawed off and little holes have scratched through her neck. With this much love, Bubba may not see another three and a half years. Three and half years of giggles, peek-a-boos, tears, hugs, scents, fears, comforts, cuddles, dreams, stories, and songs are stored in this little sixteen by sixteen inch chenille blanket. Bubba is a treasure chest of Ava’s love. Oh, and Happy Half Birthday to you Ava! I so remember the “missing Bubba” episode! I remember you roaming the church nursery halls looking very distraught and sharing your tragic tale with any mom that would stop to listen. I remember looking around myself, to no avail. I also remember you lamenting that you couldn’t find a duplicate. I guess a one-of-a-kind little girl has to have a one-of-a-kind lovey. It was fun to read the Bubba update. So, that last picture of Ava squeezing bubba is like a pinkish/purple. How did you so that??? Beth, I use the tint option on Picassa. It’s a free picture organizer from Google.